Playing the uke is fun and easy! 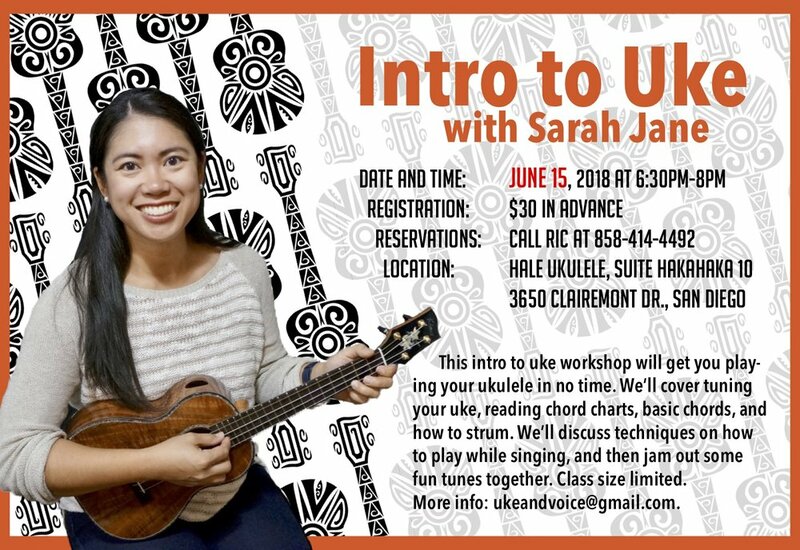 Learn how to play different chords, strum, sing songs with ukulele and voice instructor, Alison Marae. We’ll review intro topics and cover chord progressions, basic strum patterns, and singing & play techniques. Workshops are $30 each in advance. Call 858-414-4492 to reserve your spot. We’ll cover tuning, holding the instrument, reading, chord charts, and simple strumming. We’ll cover more chords and strumming techniques, including how to add style and percussion. We are excited to have two wonderful Hawaiian Style Musicians joining us for a double workshop. Both musicians are fantastic teachers and you won’t want to miss out on this one of a kind experience. Both workshops are only $50 - or you can do a single workshop for $30. Please call ahead to reserve your spot- posting via Facebook does not guarantee you a seat. Steven focuses on 3 popular traditional Hawaiian songs from the popular *He Mele Aloha songbook (song handouts provided). Students will learn the common rules for participating in a traditional Hawaiian jam session or Kani Ka Pila. These general principals are the foundation for any type of jam session and can be utilized in any genre of music. Focus on leading your own song in a group setting and valuable skills like listening, awareness, understanding song structure and keys. To highlight their new skills, each student will have the opportunity to lead the group with their own song of choice. *Limited number of He Mele Aloha Books will be available for purchase. Bryan will take you through steps using your own Musical awareness to make choices while playing in real time. This class is perfect for those that are looking to add more to their comping and listening skills. To get the most out of this class, students should be comfortable with their basic chords and barre chords. Bryan Tolentino & Neal Chin Workshops & Show! Join us for an amazing Sunday series of events! There will be two workshops - Bryan Tolentino starting off at at 1PM, followed by Neal at 3PM. Once the workshops are finished, feel free to head down to the San Diego Mission Bay Boat & Ski Club for Dinner & a Concert! Dinner is just $10 (Burgers and desserts) and the concert will be $15. The concert will be hosted by Craig Chee & Sarah Maisel, featuring Bryan Tolentino and Neal Chin. It’s going to be an unforgettable day, so be sure to sign up! RESERVER YOUR SPOT for the workshops - seating is limited and you MUST call ahead. 858-414-4492. Dani Joy joined us last year, and put on a wonderful workshop and demonstration. 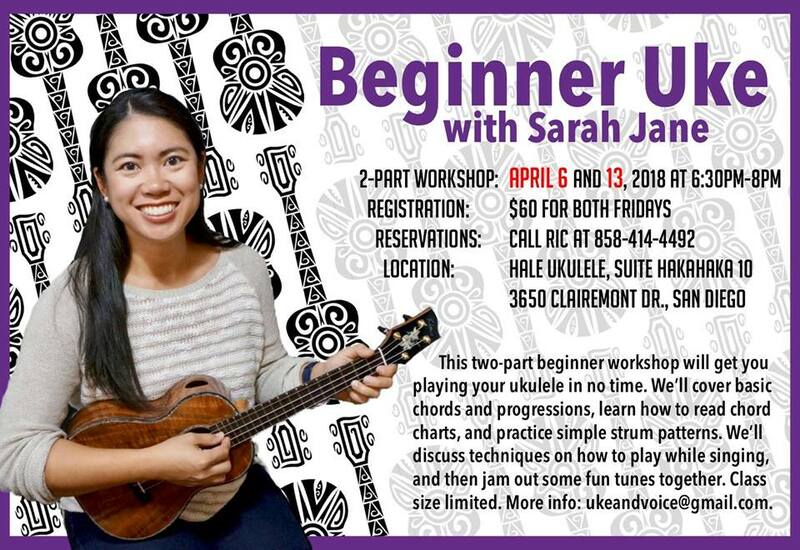 You'll enjoy learning from this sweet 'Ukulele Lady, and be tapping your toes nonstop during the demonstration. Numbers and letters in music, oh my! In this one hour workshop Dani Joy will take your hand and lead you through the mysteries of the Nashville Number System (you know, Do Re Mi…. 1 2 3…) Understanding how notes are grouped into scales with adjoining “scale degrees” or “numbers” will open up the world of music to you for a greater depth of study. Finally you can join the jam of “one four five” chord songs your friends are always talking about. You’ll also understand how chords are formed and learn how to memorize song progressions, transpose, and play with confidence! Tickets are $30 and need to be bought in advance through Hale ‘Ukulele. This is sure to sell out, so be sure to get your tickets soon. We are so excited to have one of Hawai’i’s finest musicians - Bryan Tolentino. He has had the pleasure to perform Herb Ohta Jr., Jake Shimabukuro, Raiatea Helm, and more! Bryan embodies the spirit of Aloha. His gentle touch and sweet vocals take you away to the islands. Come learn the Hawaiian way and join us for an event that you will never forget! Bryan is known for his ability to compliment any player he performs with. This takes skill, but also listening and being aware of what is going on around you. Taking you through his thought process of moving up the fretboard, he’ll get you truly LISTENING to those around you. This class will give you the tools you need to enhance any style of jam. There will be something for everyone, so please don’t miss out on this opportunity. Andrew started playing the ukulele when he was 13 years old and hasn't looked back. His love and passion of this unique instrument shows in his playing and song writing ability. In this workshop Andrew will go over musical awareness while playing in a group or as a soloist. How to use dynamics to enhance your variety and add emotion to your playing and tips for those interested in performing. His first CD entitled "The Beginning" on which he composed eight of the 11 songs was a finalist in the "Ukulele Album of the Year" category at the 2014 Na Hoku Hanohano Awards. One of the up and coming crop of talented young ukulele virtuosos, he is always trying to find a way to take the ukulele to another level. His music is a mix of pop, Hawaiian, rock, latin and a little bit of jazz. A full concert will happen September 6th! Don't miss it! Join us for dinner and a concert at the San Diego Mission Bay Boat and Ski Club. The performance is free (tips appreciated) and dinner tickets are $10 per person. Dinner will be served from 5:00 - 6:30 with the show beginning at 6:30. The San Diego Mission Bay Boat and Ski Club is a private club but for this special performance, Hale Ukulele is sponsoring your attendance. Please call the store to reserve your spot and RSVP for a dinner ticket. Hale Ukulele 858-414-4492. Workshop happening September 7th at Hale Ukulele - Don't miss it! By popular request, Milo is back in town to do another Uke Bass workshop! In this class he will expand on the basics and get you playing some more exciting bass lines. 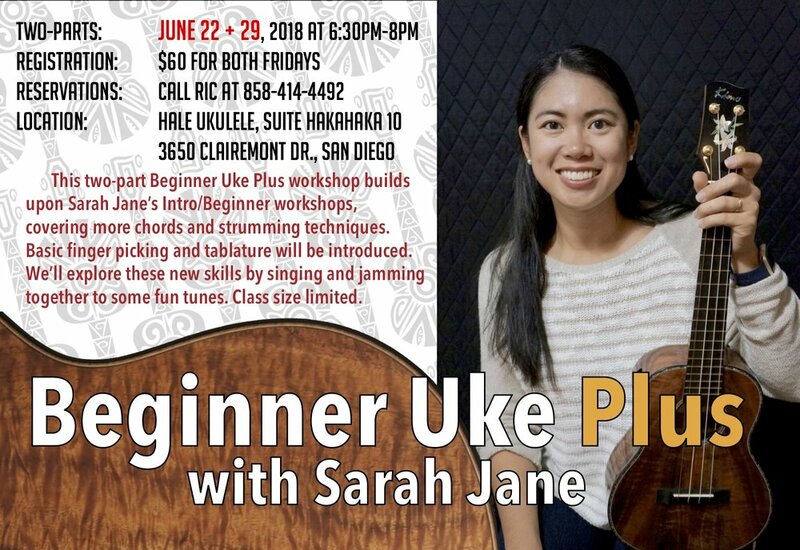 This is perfect class for those that have taken intro Uke Bass workshops in the past. Steven teaches the most commonly used strum patterns in traditional Hawaiian music. Students will learn methods in the "Old Style" by watching, emulating and using the rhythms learned in several Hawaiian songs via kani ka pila format. All levels welcome! Part of the fun of playing 'ukulele is making music together as a group. Of course, after playing with a group regularly, you'll find that you want to do more to enhance your playing. Craig will take you through a variety of ways of maximizing your practice time during jam sessions. With learning basic jam etiquette, a touch of theory, and chord shapes and patterns, you'll be surprised how much more fun a Jam session can be! Many of us perform in ensembles and want to find ways of creating arrangements other than strumming. In this class, we will take an unlikely song (or two) and create arrangements for 3 'ukulele parts. By listening to the original tunes, we'll begin to create ideas to help enhance the song AND the group. To get the most out of this class, please know your basic chord shapes and be comfortable with barre chords. Just in time for those lad back summer sessions. Slack key is a uniquely Hawaiian music style. But most of it is played on the guitar! Ever want to play slack key on your ukulele? Come join UkeKurt for an introduction to slack key style for the ukulele. This class is well suited to beginner through intermediate players. It will be taught with a low G tuning but high G is welcome! Players should be able to transition smoothly through the C, F, D7, and G7 chords. We will cover the bass drone, two finger pluck, the rolling pick, and just a bit of theory. You know your basic chords and have been playing for a while now. Even though strumming is a ton of fun, wouldn't you like to make your uke jams more fun? This class will go over some great substitution chords, runs and walk downs, to get you adding more to songs you already know and love. We will also discuss how to make practice time more efficient and FUN. High or Low G Uke is fine. Craig will take you through a varitey of tricks that the pros use. He'll get you mastering the dreaded barre chord, take you through some great alternative strum patterns, and of course STRETCHES! He will also guide you on finding your own 'ukulele voice- so you can truly play what you feel. High G is requested, but not required. Craig will give you that jump start in learning about basic music theory and how it's applied on the 'ukulele. By the end of the class you'll know why chords are named the way they are, how to anticipate chord changes, utilize this new knowledge to start improvising and be able to play chord shapes all over the neck!